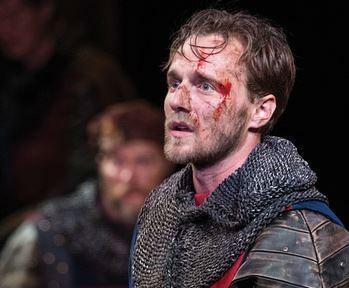 Sam Ashdown as King Henry V in the Utah Shakespeare Festival’s 2016 production of Henry V.
Photo by Karl Hugh. Copyright Utah Shakespeare Festival 2016. Thursday, we’re live at the Utah Shakespeare Festival with a look at the bard’s great history Henry V. Director Brian Vaughn says the play represents a battle of conscience. 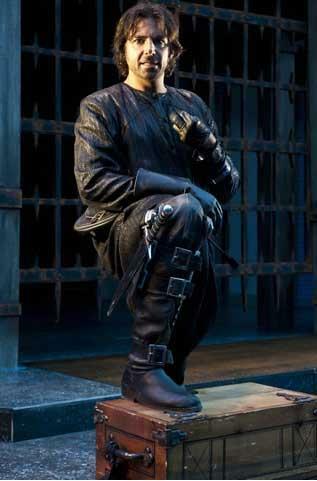 Through two earlier works, Shakespeare’s audience knows Prince Hal as a wild and irresponsible young man. But now he has the crown, and must weigh right and wrong to grow into the role of king. We’ll talk about the character, how he’s been portrayed over time, and what the play has to say about leadership and authority. We invite you to be part of the audience for this live conversation. Join us on the Eccles Grand Promenade at the Engelstad Theatre in Cedar City. Live show begins at 11:00 a.m. Please arrive and be seated by 10:50 a.m., the broadcast will conclude at 12:00 p.m.
Sam Ashdown plays Henry in the Festival's production. James Mardock teaches at University of Nevada, Reno and is editor of Broadview Press' edition of Henry V [Amazon|Indiebound] It includes his extensive introduction to the play. Friday, we're broadcasting from Cedar City, where Utah Shakespeare Festival is celebrating it's 50th anniversary. We'll talk to Artistic Directors Brian Vaughn and David Ivers about their vision for the Festival. We'll also explore Shakespeare's complicated character Richard III and ask how he measures against the history's assessment of the last Plantagenet king.